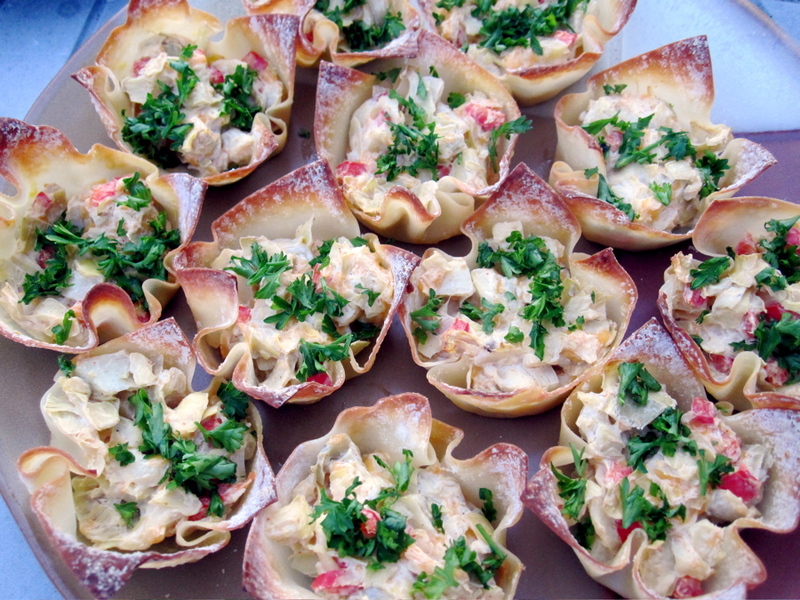 Here is my recipe of the week – Artichoke Tarts. I found the recipe on the Weight Watchers website. Sometimes, my husband and I will just have appetizers for supper and last Friday, this is what we did. This was one of the appetizers we had and it was so yummy! I highly suggest using Nasoya brand for the wonton wrappers. I have found they are the best. I have tried Melissa’s brand and I have found them to be a little to floury. 2. Coat a 16-hole miniature muffin pan with cooking spray. Gently press 1 wonton wrapper into each muffin hole, allowing ends to extend above cups. Coat edges of wrappers with cooking spray and set aside. 3. Combine cheeses, cayenne pepper and mustard in a medium bowl; mix well. Stir in red pepper and artichoke hearts; spoon about 1 teaspoon of cheese mixture into each muffin cup. 4. Bake until cheese mixture is set and edges of wrappers are lightly browned, about 15 minutes. Garnish with parsley and serve. Yields 2 tarts per serving.